'A Sense Of Panic,' Says Witness To Navy Yard Shooting : The Two-Way Two people describe escaping a building as a gunman with a rifle shot at them from down the hall. People exited a building with their hands up after a shooting Monday at the Washington Navy Yard in Washington, D.C.
For some employees at the Washington Navy Yard, the first sign that something was wrong came when a fire alarm went off early Monday morning. Terrie Durham, speaking to ABC News 7, said she was sitting at her desk when the alarm went off. At first, Durham thought it was probably a drill. Then, fire wardens "came by quickly and told everyone to get out of the building now. So, that's when we started moving," she said. As she and co-worker Todd Brundidge, who The Associated Press described as an executive assistant with Navy Sea Systems Command, tried to get out of the building, they heard gunshots and spotted a gunman in a corridor. "As we were exiting the back door, we noticed him down the hall," Brundidge told the TV station. "We heard shots and as he came around the corner. He aimed his gun at us and he fired at least two or three shots and we ran down the stairs to get out of the building." Durham says the gunman "was far enough down the hall that we couldn't see his face, but we could see him with the rifle. He raised and fired at us. He hit high on the wall just as we were trying to leave." Brundidge nodded his head in agreement when Durham described the man wielding the gun as "tall and dark skinned" but said he was too far away to see much else. Durham said the man appeared to be carrying a rifle. Brundidge was quoted in The Washington Times as saying, "We were lucky he was a bad shot." The Washington Post interviewed Navy Cmdr. Tim Jirus, who described being in the alleyway in front of a building when a man he was talking to was shot down. "I turned and ran to the back side of that building to put something between me and the shooter," Jirus said. "Witnesses described a gunman opening fire from the fourth floor, aiming down on people in the first-floor cafeteria. Others said a gunman fired at them in a third-floor hallway." "As witnesses emerged from the building, a helicopter hovered over the building, schools were on lockdown and airplanes at nearby Reagan National Airport were briefly grounded. Less than 2 miles away, security was beefed up at the Capitol, but officials said there was no known threat there." The AP quoted Brundidge as saying he and co-workers encountered a gunman on the building's third floor and that the gunman was wearing all blue. 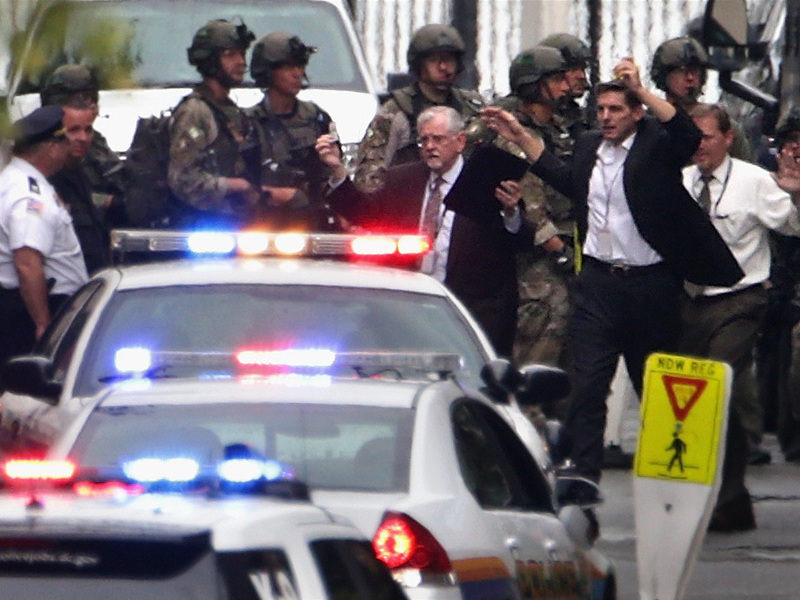 Rick Mason, a program management analyst who is a civilian with the U.S. Navy, told the AP a gunman was shooting from a fourth floor overlook in the hallway outside his office. Patricia Ward, who works at the Navy Yard, told the AP that she heard "three gunshots in a row." A few seconds later, Ward told the AP that she heard four more gunshots and then security guards shouted, "Run, run, run." Don Andres, who is a staffer for Nevada Rep. Steven Horsford and lives near the Navy Yard, told MSNBC that he was running late to work when he saw "a swarm of guys in civilian clothes who work for the Navy" who told him there was an active shooter and that he should probably stay away. He said he decided to go into work anyway and described "a sense of panic" at the scene. "As I drive around the corner, I see folks are definitely scared. I see police boats in the water. I start to drive up New Jersey, and right on New Jersey [Ave.], [that's] where I took a couple of photos," he said. "There was a man lying on the corner, just across from the Metro [subway], across from the [Department of Transportation], and you see people are definitely scared, police are putting up the caution tape. " Bill Raines, who also lives in the neighborhood, reported seeing a man on the ground who was receiving CPR. "I'm not sure if that was related or not," he said.